Diabolus in Musica are renowned for presenting exciting and entertaining performances of Elizabethan popular music, in gorgeous authentic costumes, interspersed with humorous ancedotes and audience participation. For clients who have the budget, we can expand to a full 4-part band of waits. This is an ideal concert format, as it opens up the vast, sophisticated repertoire of renaissance consort music. It is also excellent for any event that requires a touch of grandeur. 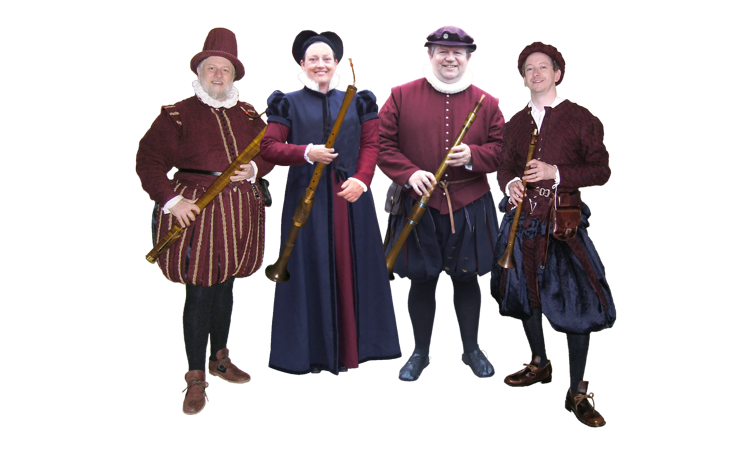 We fully exploit the traditions of the original renaissance town bands, who could provide appropriate music for any setting, from court to church to tavern to street, on an impressive and constantly changing array of instruments. Our main focus is on the glorious sonorities of the shawm and curtal consort, but we also play sackbutt, cornetti, recorders, bagpipes, renaissance guitar, hurdy-gurdy, and a few oddities. We occasionally sing. Our repertoire encompasses grand processional music, 'serious' consort music, arrangements of madrigals, chansons and motets, dance music, popular tunes, and ballads. The core of our repertoire is English, but we include pieces from all over Europe. We have recently returned from a second successful appearance at the Medieval Festival in Hamar, Norway. This year, we played for the arrival of King Harald V and Queen Sonja, who were visiting the Festival, and we gave a concert in the Domkirkoedden (the amazing glass cathedral), which was very well received.